Small rooms can be a challenge for the home decorator. Whether it's an office, sewing room, bedroom or just a small living room, the colors you pick have a huge impact in the feel of the room. As one of the largest areas of color in the room, your floor choice is important. Indianapolis flooring store Kermans has been helping homeowners find the best floors for any room for decades. Our recommendation: If you want to open up the room or balance out darker walls, go with a lighter floor. You've got great choices in lighter colored wood, tile, luxury vinyl and carpet. Don't worry - when we say light-colored we don't mean white or cream. Those are great choices if you have a low traffic room. 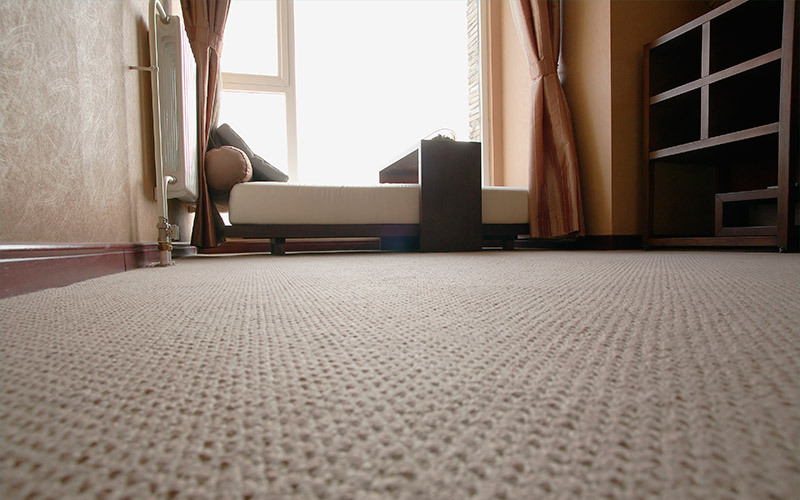 A white or cream carpet in a small guest bedroom can feel very relaxing, clean and welcoming. Let's be honest though, those colors don't stand up well to high traffic. Look at light tans, pale yellows, light greens, silvery gray... you'll be surprised at the options you have in carpet that keep the room airy and light while also introducing just a splash of color. Want to use a hard surface floor in a small room? You've hit the jackpot! From cream ceramic tile to whitewashed hardwood. Light oak or maple wood floors to grey wood-like luxury vinyl. Your options with hard surface flooring are practically endless. Hard surface floors like tile, hardwood and luxury vinyl come in any shade imaginable. Looking for bathroom flooring? Choose porcelain tile that mimics pale woods or stone - you get the look you want in a flooring that stands up to water. Looking for the perfect floor for a cozy den? Consider comfortable luxury vinyl that looks just like wood or stone but with a budget friendly price and low maintenance needs. Have a basement living area that you want to feel more homey? Install light colored tile and add an area rug beneath the furniture for the best mix of practicality and color. Finding the best floor for small rooms may feel like a challenge, but it's a challenge the flooring experts at Kermans are more than able to handle. Use our free design service to help you find the best floor option for your space - big or small. We pride ourselves on having the best service with the best selection and at prices for every budget. Bring your flooring challenge to our Indianapolis flooring store and we'll get you started.